Humidity + Heat = Disaster! We had a very humid and rainy Saturday and I must say, these two combined spell disaster when it comes to rolled fondant covered cakes, at least in my kitchen. While I normally tend to avoid putting such cakes in the fridge by using fillings which don’t require any refrigeration, sometimes they just need to be. 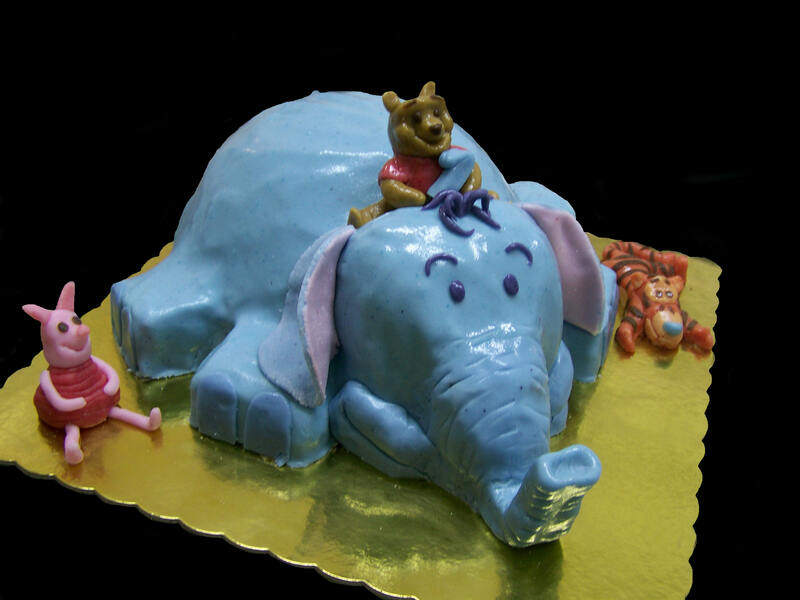 This Dumbo and Winnie cake was a chocolate devil’s food with an almond French buttercream and roasted almonds. Understandably, since the French buttercream is perishable, it needed refrigeration and what that meant in this case was a very sweaty cake! (It was crumb coated in American buttercream). On occasion when I do refrigerate the fondant covered cakes they don’t sweat nearly as much as they did this weekend, and at this point I’m convinced the weather was to blame! Here’s another cake I made along with the previous one. 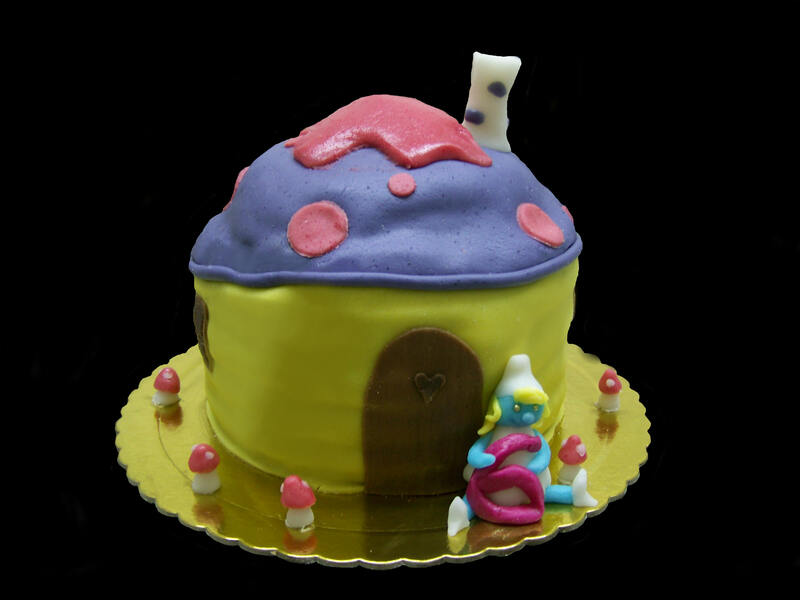 Smurfette and her mushroom house. This was an almond cake with a whipped ganache filling. It didn’t need refrigeration but guess what! It started sweating right before my eyes as I was covering it! Damn weather! While the ganache should have normally thickened, it was actually softening over time resulting in layers slowly squashing the filling outwards. A disaster I tell you! The design I was asked to make was somewhat different from the end result. There were various smurf heads sticking out of the windows which was adorable, but considering I didn’t find the cake too stable I wisely chose not to put them there. It was also a little higher and the mushroom head wider but for the same reasons, I had to stick to something more straight and minimal. And, since the ganache was going soft, for precaution, I had to use the fridge. I also made a third cake which was a cute truck. This was the ultimate disaster in which it collapsed and fell apart. It was returned, I managed to fix it the best I could. No picture.. I’ll let your imagination run for that one! This one actually collapsed because I chose the filling badly. It was a white chocolate whipped ganache with strawberry. It was slippery, unstable and of course.. the weather surely made everything worse for me! 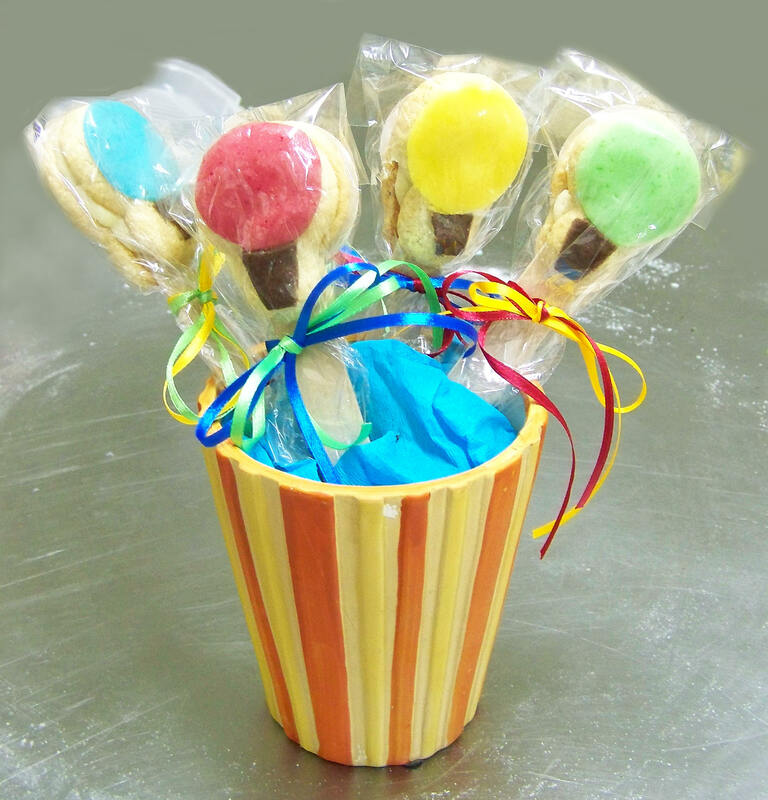 And finally, I made 250 of these cute chewy almond air balloon cookies, filled with white chocolate almond ganache for a baptism. I love the elephant cake. I don’t know if you’re willing to share secrets…but if you are, how do you come up with the basic cake shape for the elephant? Hi! I’m glad you like it! The shape is basically 2 round cakes for the body, a bigger one on the bottom and a smaller one on top in the center and I carved the edges all around at a 45 degree angle. Then I put a rectangle for the head, on top of the bottom cake and in front of the little top one, that I also rounded off and just filled in all the gaps and rounded off the body with the buttercream. The feet were 4 small squares. All pieces were split in two and filled and the rest was basically rounded off and filled with the buttercream. The trunk and mouth is all fondant that I shaped and attached to the head. I hope that was helpful.